Cofelia’s Jacket | Barbie Who? It is done! I finally have a new Barbie Who? piece finished for Cofelia. I am proud to present Cofelia’s jacket. This jacket was not easy to make. I ended up going through several different patterns before I gave up and created my own pattern for it. I have spent nearly a month on this, which is fairly ridiculous. I’m sorry this side- tracked me to this extent. 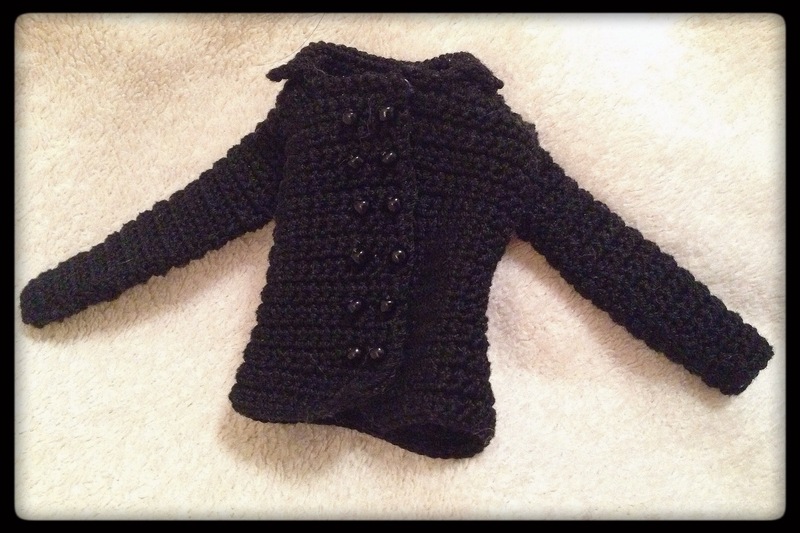 The first coat pattern I attempted was cute, but it required worsted weight yarn. 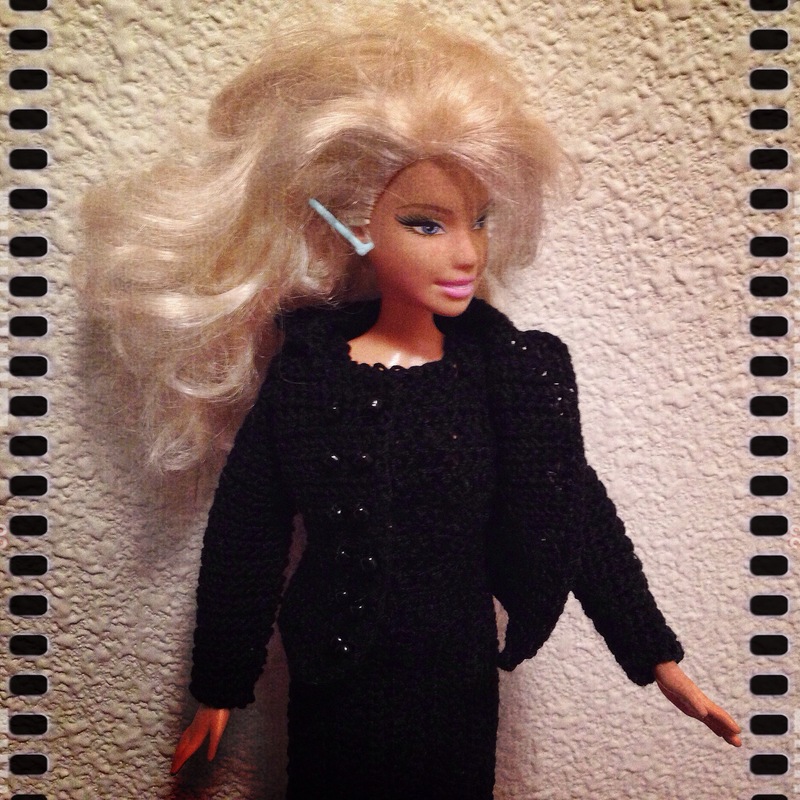 For consistency, I need the jacket to be made with the same yarn as the skirt – which is a size 10 crochet thread. I didn’t realize that pattern required worsted weight until I had finished the first two rows and saw it was waaaaaay too small for my doll. I unraveled my work and went looking for a new pattern. The second pattern looked great in the bloggers pictures, but it was so badly written that I gave up after ten rows. Maybe I’m not at an ‘intermediate’ level in crochet, or maybe it was the density of the pattern that caused my problems. Either way, we just weren’t compatible and I had to move on. After that, I looked for patters on Pinterest. I found several paid patterns that were promising, but I don’t want to spend money on a relatively simple endeavor. It was at this point that I decided to make my own pattern. I have made infant vests before, so I just used the techniques I learned from that application while adding a collar and sleeves. This is the same technique I used for the peasant top Cofelia wears under this jacket. After everything, I am pleased with the results. I went through several different phases to create the pattern for this jacket. At first I tried to make it with black yarn, but I had a hard time counting the stitches with that color. I then made a version of it with off-white yarn in the same size. I was able to make a nice jacket, write down the pattern, and adjust it for the final product. It took extra time because I made the pattern myself. I blame this for throwing the first doll into November. The original goal was to finish the first doll before the end of September, but that was overly optimistic. Despite this setback, I am very pleased with how the jacket turned out and how well it pulls the whole ensemble together. To make this, I used thread bought at the hobby store, beads from my sewing box, and snaps from a second-hand store. It doesn’t have as many thrifty elements as other pieces I’ve worked on, but I still find it delightful. The photos don’t do this jacket justice; it is so hard for my camera to capture the detail in such a dark yarn. The next element for the Cofelia doll I will be making is an adipose (or two) to hang out with her. I mean, what would astronauts be without her charges? I already have white thread, a pattern, and my crochet needle at the ready for it, so keep your eyes peeled for the next update! If any of you are ambitious and want to make one of your own, here is a link to the pattern I created.